It must be a slow news week. All anyone can talk about is LeBron James (am I the only person on the planet who could give a rats you-know-what where that guy ends up?). Well, LeBron and the heat wave, that is. Here in the Northeast, temps have soared over the 100 degree mark more than once this week. As the days melt into one another, the humidity keeps climbing, so that even a day like today, which feels positively cool compared to Tuesday, is already heavy and promises to be a July scorcher. Alas, I digress. The other night it was so hot and sticky in Huntington that we decided to high tail it to the beach for dinner. 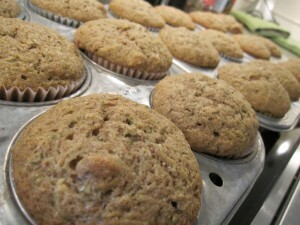 I packed a cooler with my favorite bbq chicken, this summer corn salad, and the these zucchini muffins, along with lots and lots of fresh watermelon cubes. The muffin recipe came to me courtesy of my friend Ellie, a top rate baker. She’s modified it to include only heart healthy olive oil, no butter, and one cup of whole wheat flour. They are delicious. The olive oil keeps them dense and moist. She made them for me in mini-loaves. I was pressed for baking time so I did muffins, and have been thoroughly enjoying them all week for breakfast as well (a quick note on this: the recipe says it makes 16 muffins. I only use my grandmother’s old 1960’s muffin tins, and I got 22 out of them. Just goes to show you how grossly out of control our portion sizes have become. But that’s a story for another time). I picked hubby up from the steamy train platform, already drenched in sweat (poor guy was in a full suit). Rolling down the windows as we tore through town and came out the other side, it felt like we were escaping from a very sticky prison. As we pulled into the West Neck beach parking lot, we were kissed by the first breezes we’d felt all week, which carried with them the strong smell of brine. Kevin made a bee-line for the water, having furiously changed in the parking lot, ever the five year old at heart. I set up camp in my chair, drinking in the cooler air and the heady perfume of summertime by the sea. Sweet relief. Beat eggs until foamy. Add oil, sugar, vanilla and zucchini. Mix well. Add dry ingredients and mix lightly. Pour into greased pans and lower oven temp to 325. If using 9″ loaf pans, bake for 1 hour. If using muffin pan, bake for 25 – 30 min.